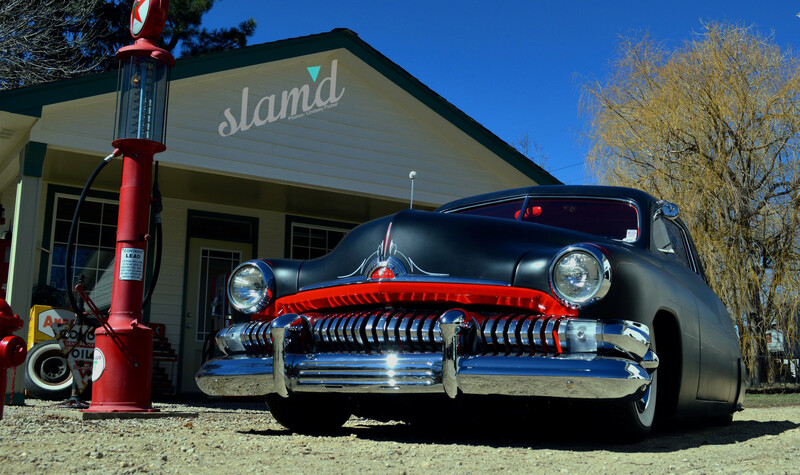 In the world of chopped, dropped and Slam’d, sometimes it can be difficult to stand out. 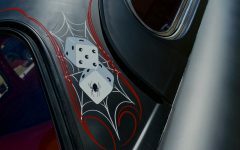 After all, not everyone can build a ride that grabs attention from across show grounds as well as acts as a go-to ride for weekend cruises and all-out good times. 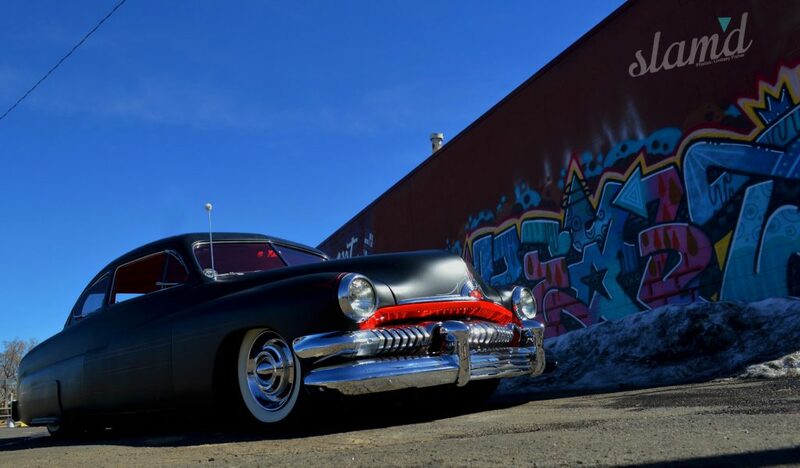 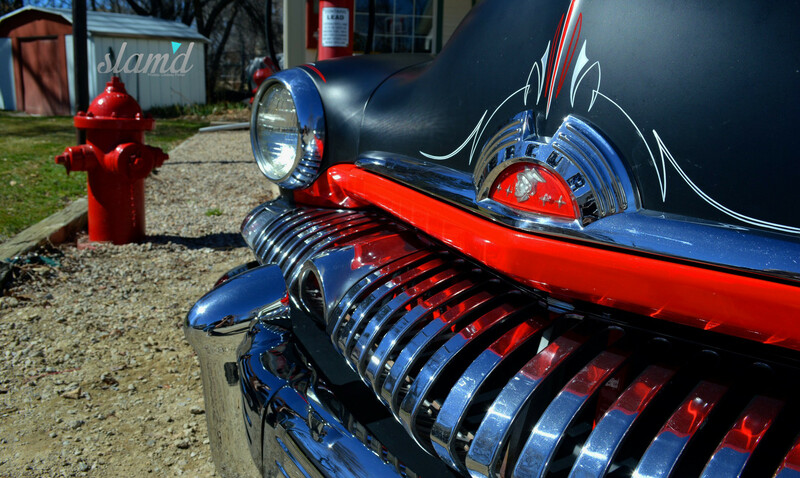 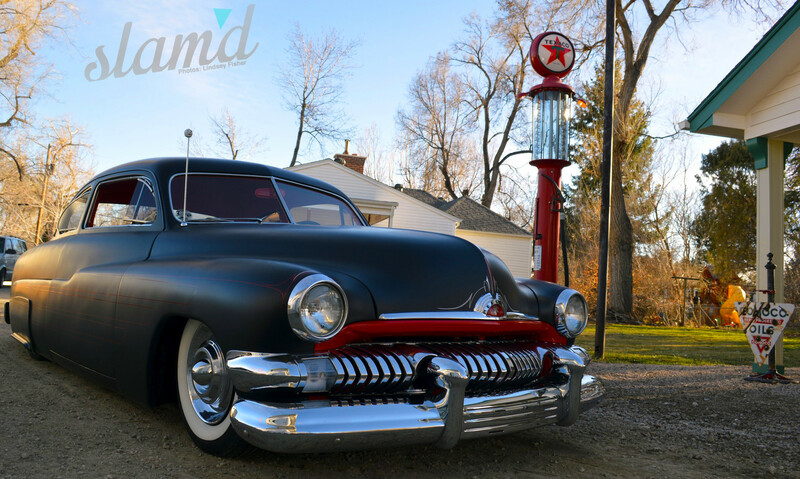 But for Amber and Steve Schwalb, that’s exactly what their 1951 2-door Mercury is all about! 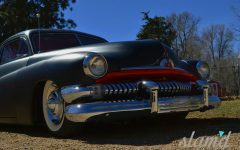 These days everyone is used to the leadsled Merc’ appeal with heavy chops and mods galore. 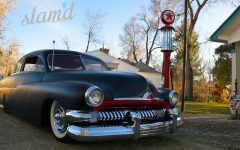 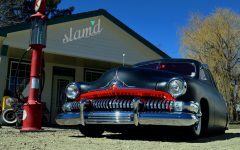 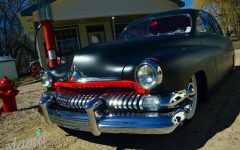 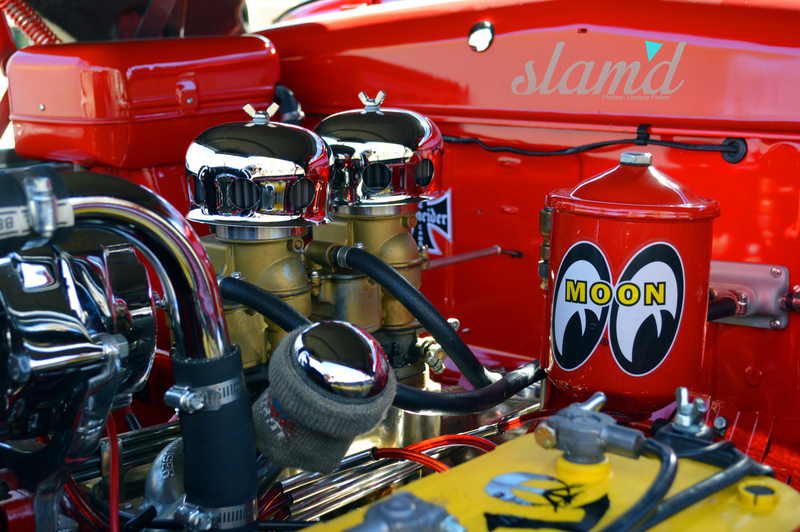 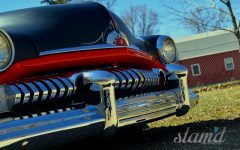 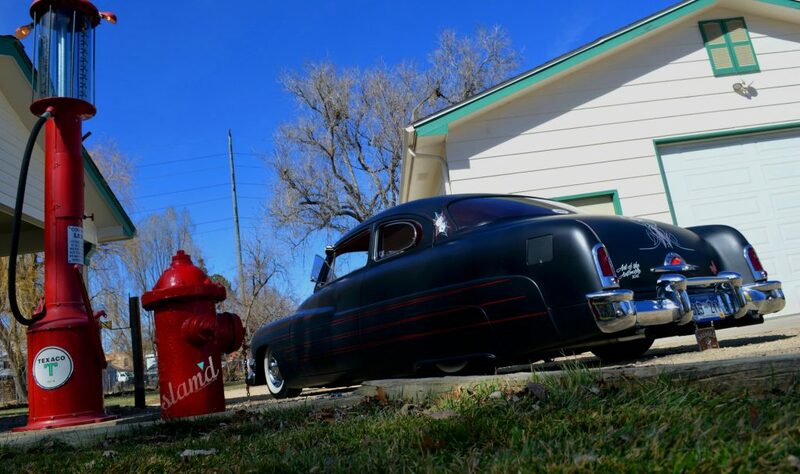 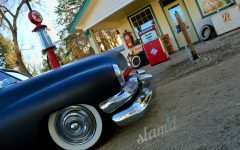 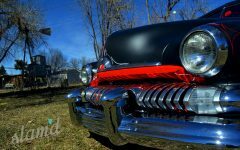 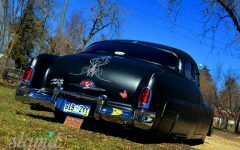 The “leadsled” movement and classic chopped rods are not only an icon of the hot rod scene, but also one of the founding fathers, if you will, of slammed culture. 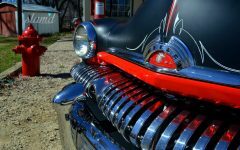 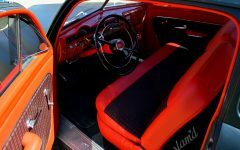 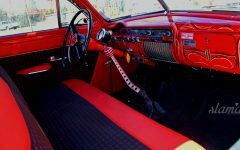 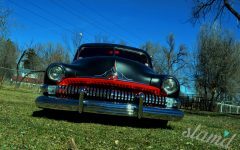 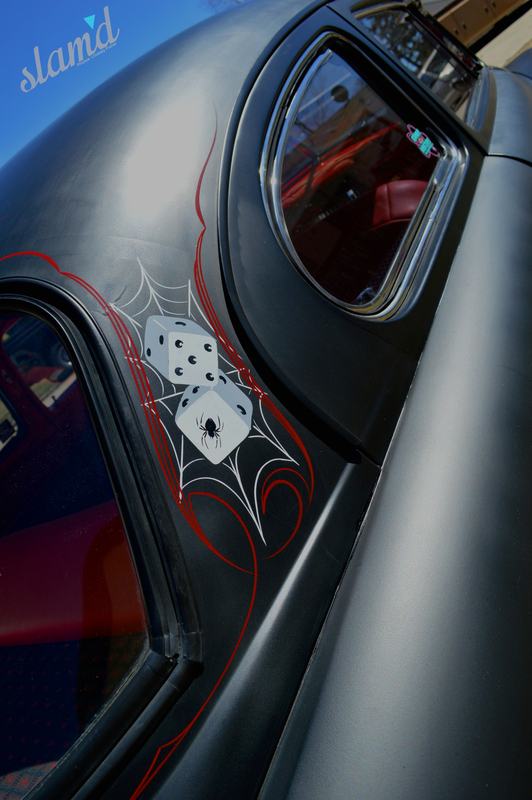 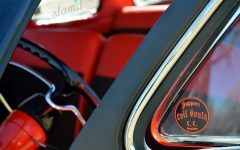 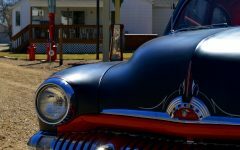 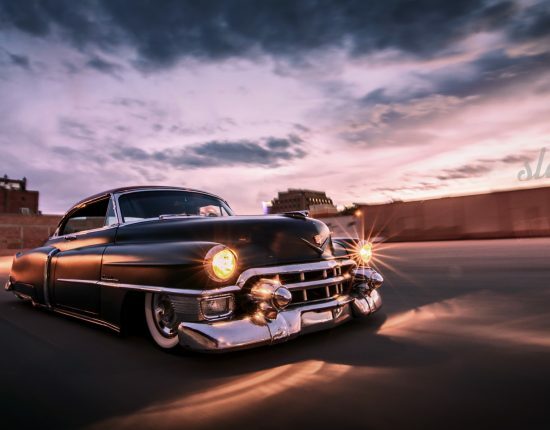 Giving way to the body modifications and and customizations of today, the “cut-it-up” era of the ’50s and ’60s was the beginning of the custom car scene as we know it, and of course spawned other genres as the years moved forward. 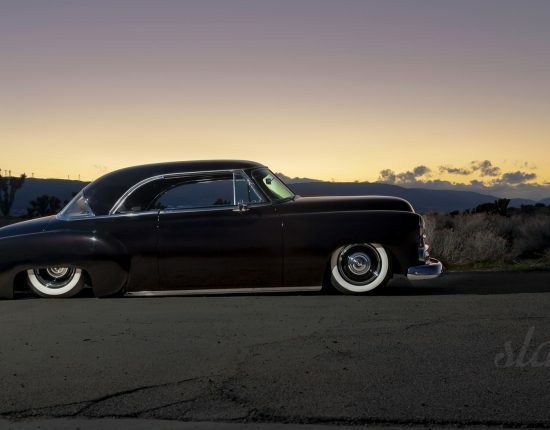 Consistent with the Matte Black and expertly pinstriped tradition, this ’51 Merc is everything a traditional leadsled fan could ask for, but with enough nuances to set it apart from the rest. Purchased by the couple in 2011, the Mercury started out as a traditional “chopped and dropped” build project, but just like many projects do, it took a few turns along the way and ended up even better than originally planned. 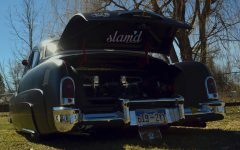 The start of the build was actually completed by a previous owner, who passed away before the car could be finished and Steve acquired the car in pieces and had to put it back together before he could see exactly what he had to work with. After piecing the Merc back together, the Schwalbs decided to go ahead with a more traditional build, taking advantage of the low-slung appeal of the sled. 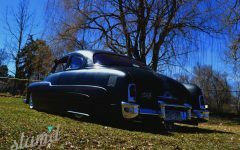 The car was originally lowered with springs to achieve a slammed altitude adjustment, which went over well for awhile until the couple grew tired of scraping in and out of the driveway after each and every cruise. 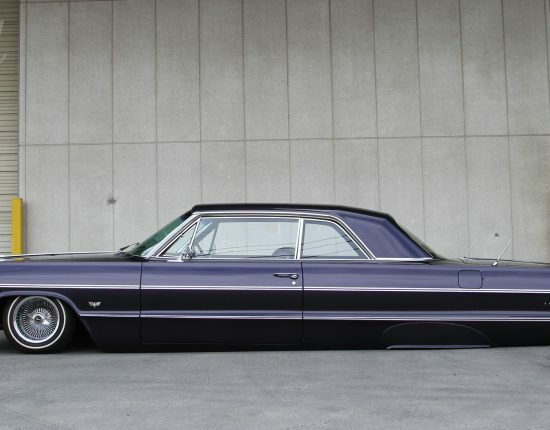 It was then decided that they would mix in some conveniences and technology with the addition of modern airbags to allow for the laid-low Merc to adjust on demand. 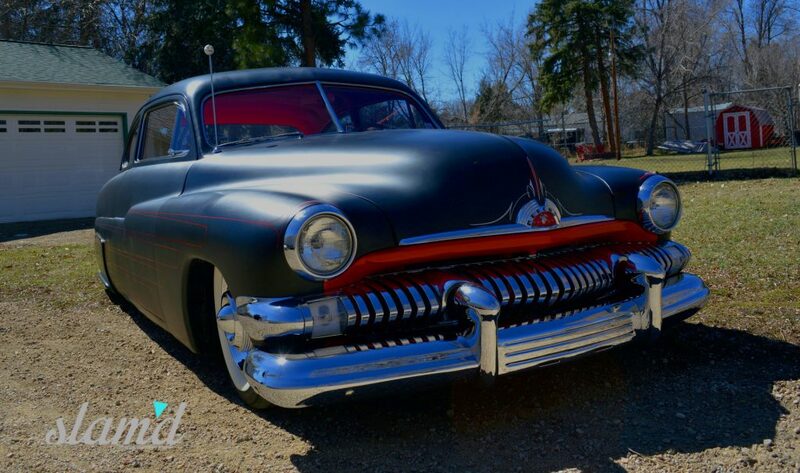 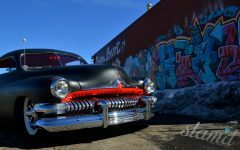 As you probably noticed, this Mercury is NOT chopped as traditional style would suggest – an interesting touch that one doesn’t see too often when building a traditionally-styled sled. 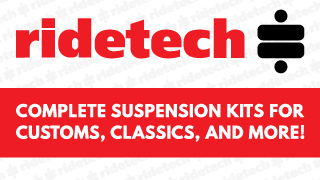 But that’s exactly what the Schwalbs were after. Other interesting touches include a highly detailed mix of pinstriping done by a collection of folks, including; Beth “Lil Dame” Kearney, Jim Sherwood and even VooDoo Larry, as well as a downright gorgeous interior with vintage plaid-draped bench seats, classic vinyl accents, and a large Gennie Shifter that seems right at home protruding from the floor. 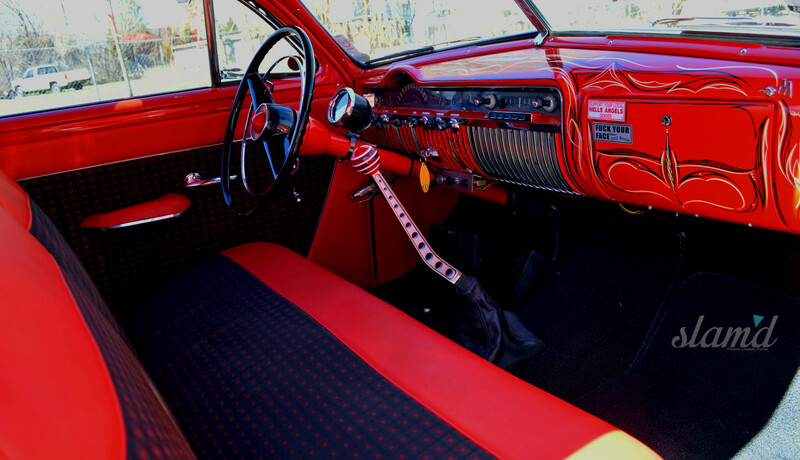 The interior is definitely one of the couple’s favorite aspects of their Merc (and ours as well). 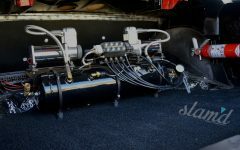 Another favorite aspect of the build for the Schwalbs is the dependability and drivability that the car provides. 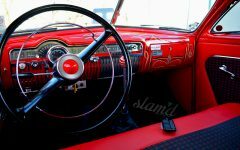 Even though they wanted a classic cruiser that would pull show car duties, they were adamant from the start about really wanting to DRIVE and enjoy their creation. 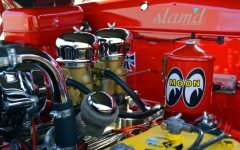 So having a classic 286ci V-8 under the hood with nothing too fancy adding to the wear-and-tear of the vehicle was the chosen powerplant. 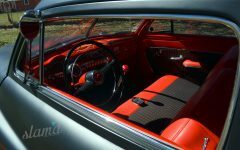 But just because we’re talking about a more subdued engine doesn’t mean this classic Merc won’t get up and go when needed. 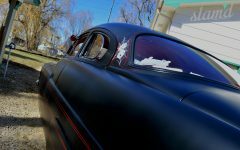 We were fortunate enough to get a ride in this beauty and just cruising around town with a car full of people, we can tell you first hand that the ride is not only smooth but also offered plenty of pep on demand. 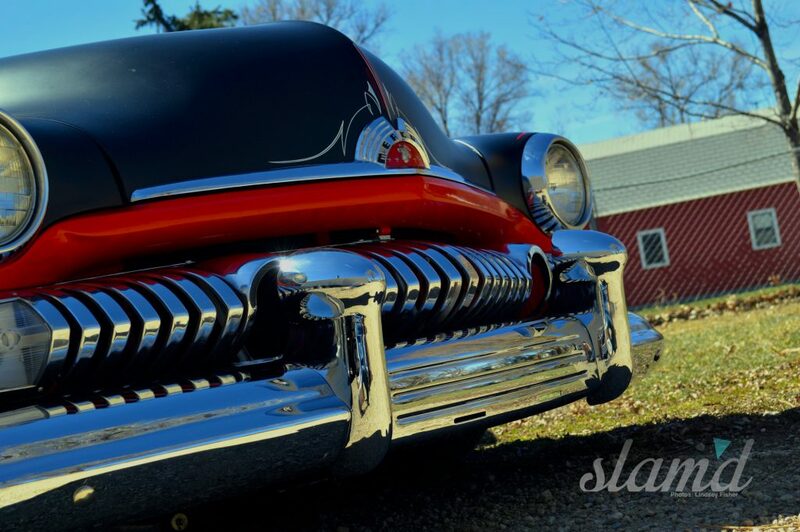 “Our Mercury may not be the nicest or the lowest out there,” Steve shared, “but it’s a car that is a great driver and we have lots of fun creating memories with friends, while enjoying the purpose-built Merc.” And this is exactly what it’s all about! 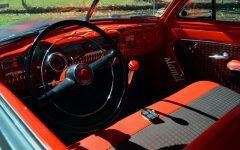 Although the couple enjoys the Merc together, along with their two children, the car is rightfully Amber’s. 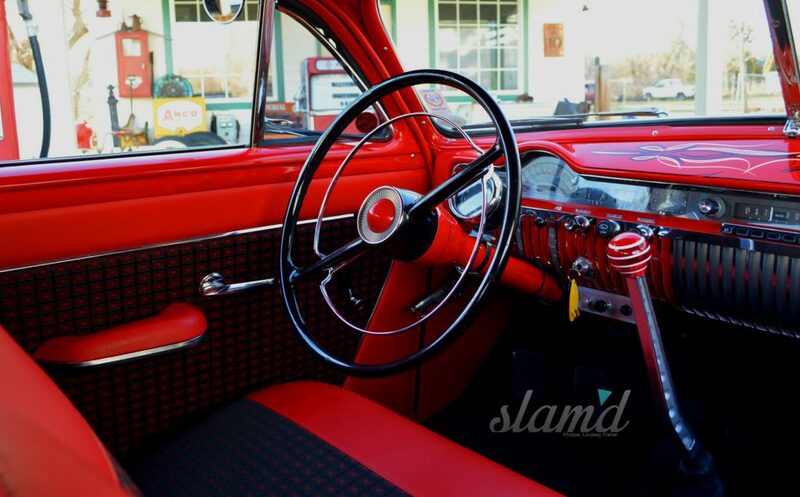 When pressed for details, we were told that Steve actually gave the car to her after a night out with friends and a few “adult beverages” and to that we say – nice work Amber! 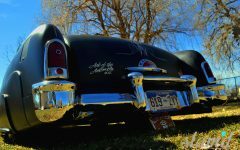 “This is the only car that my wife will drive that is a standard 5-speed transmission,” Steve explained, “and for that reason, I gifted her the car and she is the official proud owner.” Over the last couple of years, Amber and Steve have taken their Merc on a number of outings, both with their current car clubs, the Denver Roadsters and the Savages, as well as with groups of friends, including many trips to the local Golden Super Cruise, and last year’s Lead Sled Spectacular show in Kansas, where VooDoo Larry pinstriped the car. 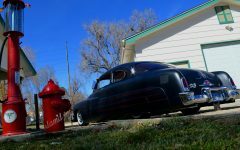 The longest trip taken so far is over 1,400 miles from Lakewood, Colorado to Las Vegas and back for the 2015 Viva Las Vegas show. 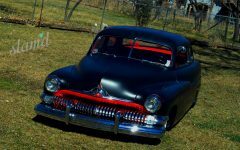 There’s nothing quite like a build that you’ve put blood, sweat and tears into and then get to enjoy on a frequent basis. 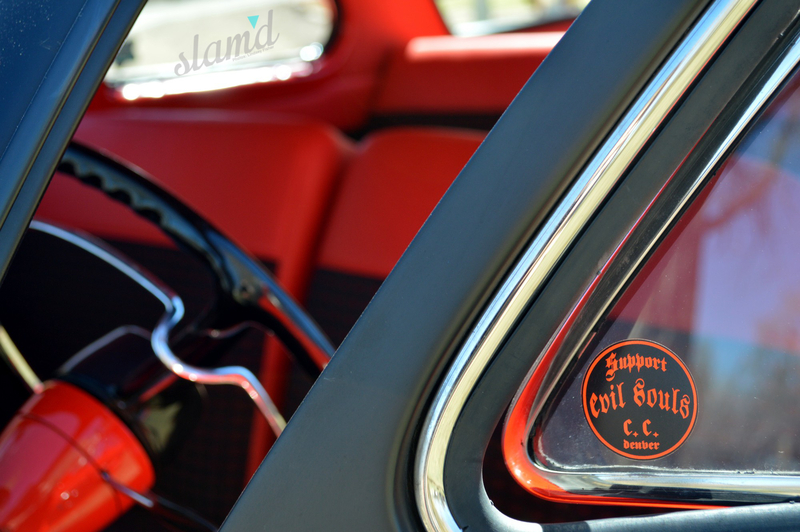 As the Schwalbs told us, this may be the vehicle they’ve had the most fun with thus far, and they own plenty more, including; a ’32 Ford roadster, ’46 Ford Woody, ’56 Chevy Nomad, ’56 VW Bug, ’36 Ford 3-window, and a ’71 Chevy Z-28 to name a few! 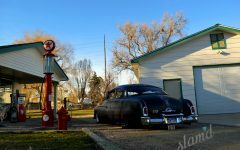 How’s that for a collection, and definitely a reigning endorsement of a build well done if this is their favorite among the stable? 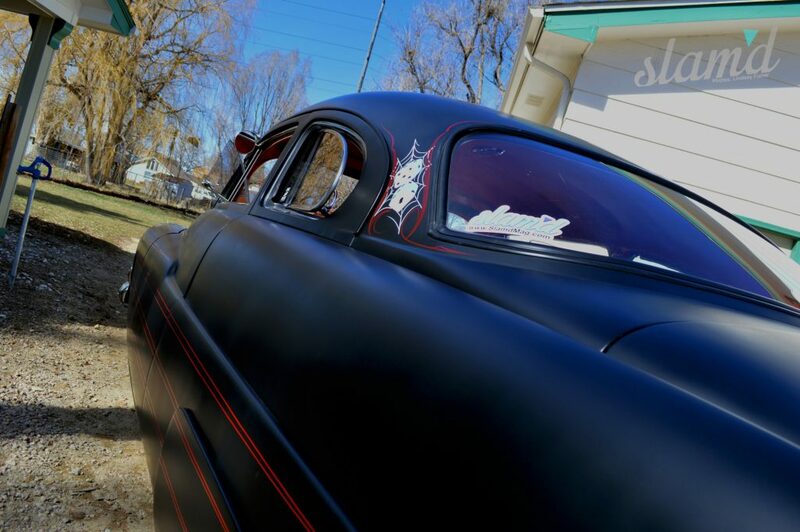 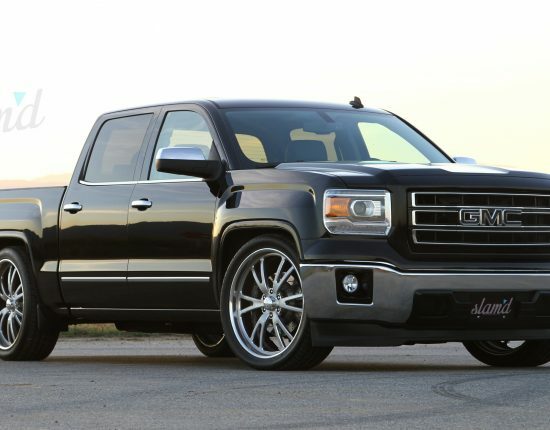 Stay tuned as we might just have more in store from the Schwalb’s custom fleet coming your way.